Ask The Super Strong Guy: What's Your Favorite Strongman Move? 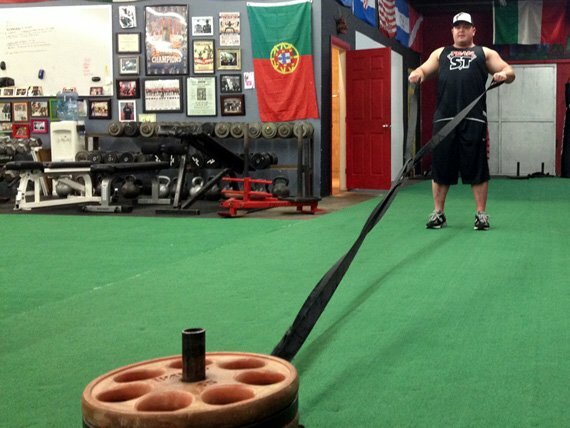 Pro powerlifter Mark Bell answers your questions about his favorite strongman moves. What's your absolute favorite strongman move, and how would I add it to my regular lifting split? My favorite strongman moves? Dragging movements, big son! Bring out your inner caveman and pull home some fresh-clubbed dinner! Or, if don't wanna drag a deer with your bare hands ... go sledding! In strongman competitions, they usually pull a plane or truck. I don't take it that far, but I do pull a weighted sled. Rogue makes some great, bomber sleds. You may want to order an extra strap for more exercise variations. Many trainees don't realize that the sheer number of moves you can do with a sled is only limited to your innovation. Bust out that meathead brain and get creative! Many also don't understand that you usually want to WALK with the sled, not run. Again, to do a full variety of sled exercises, you may need to have two straps or use an additional rope or pull-down attachment. You can do many upper body and lower body exercises with the sled. I will sometimes pull the sled for 20-30 min before a training session, alternating between upper and lower body with little rest. With lower body, I typically slap the sled strap onto my belt. What makes the sled so awesome? I'll lay it out for you, kid! "When he was a kid, Mark's dad said: "Let's go sledding." Mark has been here ever since." Work your muscles and the ol' ticker, otherwise known as your freaking heart. The sled can help increase muscle mass through various pathways but, as an added bonus, it'll also burn your lungs and work your cardiovascular system. The better conditioned you are, the better you'll recover from your workouts! Always strive to not only get bigger and stronger, but also to be in better shape. You really can't mess up sled dragging. In fact, at my gym Super Training, which I sometimes feel is full of idiots, we often use sled drags for "the humps." The who? Humps are people who just can't get sh!t right -- not for lack of effort, but because they don't have an athletic bone in their body, or they are just crazy awkward. You know the type: knock-kneed, flat-footed, and fat-faced. It's just brutally hard to teach some of these types how to perform a box squat or a deadlift with proper form. Ok, what the f@ck does that mean, dude? The eccentric (or "negative") portion of a bench press is when you lower the weight, or in any exercise when a muscle is being stretched - rather than contracted -- through a range of motion. This "muscle stretching" is often associated with muscle soreness. So, we can conclude that: No Eccentric Loading = Less Muscle Soreness. With a sled, you just pull. You stay positive. The sled allows for total manipulation of time under tension. 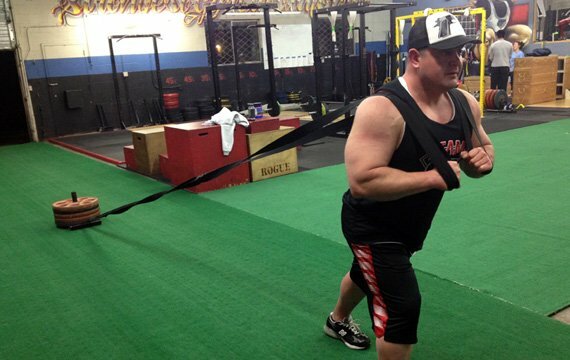 You can have your muscles under tension for as long as you can continue dragging the sled. For example, you could have a set last up to 10 minutes, provided that you're feeling bat-sh!t crazy. Sled drags let get you outside and let you work that tan! Plus, chicks driving by are turned on big time by a guy who can carry a lot of weight. Maybe they dig it because they know, one day, they will be really fat and may need someone to haul them around. Just playing. Chicks just love dudes with a sled. "Trust us: Tons of chicks are watching, they're just off-camera." See, the sled is amazing. It can make you bigger, stronger, faster, leaner and healthier! "Damn, coach: Will it make my weenis bigger, too?" I'm not sure on that, son, but it's worth a shot. Drive your heel into the ground. Try to stay on your toes. You can row high or low, or switch it up as you go. Lastly, don't forget: "Poppa been smooth since days of Underroos." If that quote doesn't inspire you to get up off your couch, throw away your Ben and Jerry's, and crush up some freakin' sled training, then nothing will. I'm going on a 312-hour break. Go subscribe to my YouTube page to see the PowerProject, which is 100% free: www.youtube.com/SuperTraining06. Remember, www.SuperTraining.TV is also free! Both sites have 1000s of videos, with over 4 million views, to help "Make the World A Better Place to Lift!"